Live animal exports have resumed from the Port of Dover in Kent amid protests calling for an end to the trade. 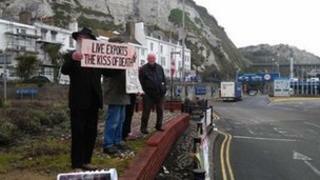 About 25 activists with banners and placards met a lorry loaded with sheep as it arrived at the port on Thursday. On Wednesday the Dover Harbour Board (DHB) announced it had given Barco de Vapor permission to start a service, following two berthing trials. The MV Joline, which has a capacity of seven trucks, will initially make one shipment a week from Dover to Calais. The decision to resume live exports from the port was condemned by opponents to the trade, including Dover Conservative MP Charlie Elphicke. Mr Elphicke tweeted: "This is a step backwards for animal welfare and the port." The DHB said it is "duty bound" to facilitate the legal trade and that any change to the legality of animal exports could only be addressed by politicians. In a statement, it said: "DHB respects the positions of all concerned about this particular trade and hopes that the significantly shorter sea crossing from Dover, when compared with other ports, will at least bring some relative benefit for the welfare of the animals in the transporters. "Barco de Vapor has indicated that its principal business will be the carriage of livestock transporters which is in itself a legal trade. "The High Court has previously made it clear that DHB must facilitate all legal trades through its port." The DHB said the Department for Environment Food and Rural Affairs was responsible for arranging animal welfare checks by its regulatory agency, the Animal Health and Veterinary Laboratories Agency. However Dil Peeling, director of campaigns at Compassion in World Farming, said it was a "dark day" for animal welfare in the UK. "Some would say it is better the trade goes through Dover, as the crossing will be quicker, but the fact is anything that makes the trade easier for exporters will surely drive up the number of animals exported, increasing suffering and perpetuating a trade that has no place in modern Britain," he said. Small-scale protests have been held at the Port of Ramsgate over live animal exports there in recent months. Last year Thanet District Council banned live exports from Ramsgate, but the ban was later overturned by the High Court. In March, the Royal Society for the Prevention of Cruelty to Animals (RSPCA) failed in a renewed attempt to challenge the legality of the export of live sheep through Ramsgate. Its lawyers asked for permission to seek a judicial review, but Mr Justice Ouseley, sitting at the High Court in London, ruled the RSPCA had failed to establish an arguable case.